I honestly don’t even know where to start with how awesome Children of Blood and Bone is. Like seriously, you should be counting down the days to its release on your calendar. It’s going to be one of the most talked about YA fantasy books of 2018, and I’m here for it. I know there’s a lot of hype surrounding Children of Blood and Bone, and that can sort of be a bit off-putting. But rest assured, this novel definitely lives up to the hype. The first aspect of the novel that I loved was the premise. A story about magic set in a West-African inspired world featuring a bad*ss black heroine? Sign me up. This leads to the second aspect, which is the setting and the worldbuilding. Oh my goodness, the worldbuilding in Children of Blood and Bone is soooo awesome. There’s so much variety within the setting alone, and it adds a great dimension to the story. Thirdly, the characters. I have a favorite, but I also don’t have a favorite because I love them all. There’s Zélie, who you’ll end up rooting for from the very first chapter. There’s Tzan, her brother, and he’s an automatic favorite because of his love for his family. He doesn’t get that much airtime compared to the other main characters, but he’s just as dimensional. If Tomi Adeyemi were to write a spinoff or short story about him, I’d be here for it. Then there’s Amari, and I love her. I wasn’t sure whether or not I would towards the beginning, but she might just be my favorite. And last but not least is our morally gray what’s to do good but doesn’t always know what good is, prince Inan. I won’t say much more about him, but you’re in for a ride with this group. Another aspect that I loved were the relationships. There’s a great hate-to-love romance that had me screaming. There’s a budding romance that I wish had gotten more airtime, but I’m sure will develop further in future books. And then there’s a powerful friendship formed between Zélie and Amari. I’m all for positive friendships in YA, and Children of Blood and Bone has a great one. All of the relationships are dynamic and I want more. The ending had me very shook. The pace picked up a bit, and I had to reread the ending a few times because I was a bit confused. Also, the ending. That’s all I’m going to say. I know Children of Blood and Bone hasn’t been released yet, but I already want the sequel. And I know the movie adaptation of Children of Blood and Bone is going to be ah-mazing. All in all, I’m so happy and grateful that I was able to read one of my top 5 anticipated 2018 releases so early in the year. 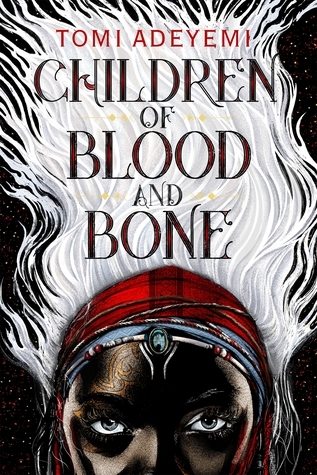 And if Children of Blood and Bone isn’t on your radar, then it absolutely should be. Previous Post Thursday’s Thoughts: Do You Set Yearly Reading Goals? Next Post Thursday’s Thoughts: How Do You Interact With Your Readers? I got this book though netgalley and am planning on reading it! I read the preview chapters and I fell in love I can’t wait to finish it! Wonderful review it made me even more excited! Thank you! I hope you keep enjoying it, and I can’t wait to hear your thoughts once you finish. The theme seems similar to Akata Witch by Nnedi Okoroafor. Great, great, great book as well. Yes! I love Akata Witch so much. That was one of my favorite childhood books, and I definitely see the similarities you mention. Nice Review! The ending had us shook too!